Ever since standing down from Barnet Council, former Edgware councillor Richard Weider (pictured left) has shown remarkable independence of thought, a trait sadly lacking in many of his former colleagues. “…to my former Conservative colleagues I urge someone else to stand for leader against Lynne. This is not necessarily because I don't want her to win. Rather, it is because I don't want you to suffer a similar disaster to Labour under the failed Prime Minister that is Gordon Brown. Richard Weider is completely right. The Conservatives won the 2006 council elections with Brian Salinger as leader, yet 21 Tory councillors (out of an electorate of 216,717) decided to ignore that result and anointed Mike Freer as leader. It would be an affront to democracy to impose a second successive leader on Barnet residents without an election. Lynne Hillan has contested the leadership of the Conservative Group twice before and lost twice. If she is finally to become leader of the Conservative group, it should only be after a contest in which all the candidates have put forward their proposals to lead the council into the next elections and beyond. But can it really be the case that only Lynne Hillan has a vision for the future of the council? Or have the other potential candidates been bought off with promises of key cabinet posts in a future Hillan Administration? Some councillors have become so addicted to their allowances that they dare not risk challenging for the leadership in case they lose and are banished to the back benches with the loss of £20,000 or more a year. One of the privileges of being a member of the Conservative Party is that you have the right to take part in the development of policy. 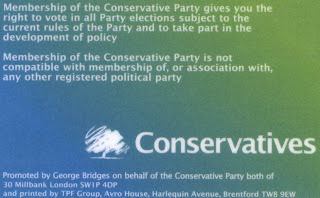 It says so quite clearly on the back of Don't Call Me Dave's membership card. Yet ordinary party members in Barnet have never been consulted over major policy issues such as the Barnet Bond, Future Shape or the decimation of the warden service. If councillors expect rank-and-file members to campaign at the next election and sell the Conservative message on the doorstep, they too need to be involved in the leadership contest. The comparison Richard Weider makes with Gordon Brown is a stark reminder of the consequence of appointing a leader simply on the basis of Buggins’ turn. We have a Prime Minister who is hopelessly out of his depth and drifting aimlessly. He has no policies, no sense of direction and no ability to communicate with the public - even over something as trivial as his favourite biscuit! He is leading his party to electoral catastrophe. Do Barnet's Tory Councillors really want to suffer the same fate? But is gets even worse than that. From press reports, it now seems that the Leader of the Conservative Group now thinks he / she has the right to thrown people out of the Group (withdraw the whip) on his / her own without any further ado. This isn't what the rules of their Group say. Why isn't there a furious row inside the Conservative Group about any Leader thinking he has the power to decides its membership rather than the membership deciding the Leader? The Conservative Group resembles a medieval King's Court (with Archbishop Hillan and court jester Coleman) than a modern Cameron like political organisation believing in transparency and democracy.